Our Dog Parade is a tribute to the Scottish & Irish working dogs bred centuries before on the mountainsides of the Highlands and the pastures of the misty Lowlands. While we will lead off and feature these breeds from the British Isles we welcome all dogs that you're proud enough of to join in our parade. There is no charge to join in our parade but any donations received will be given to the Jefferson County Humane Society. The parade will assemble in Graveyard Alley beside the Shepard's Inn by 11:40am and at 11:50pm will march to the music while parading to the intersection of Main St. & Gay St. & back down to near the Food Vendors area & return. Days Gone By, a wonderful old-time Children's Playground, will return to the Festival again in 2018, sponsored by Bush Bros.
Phil Lakin will also be bringing his Border Collies to perform sheepdog trial demonstrations on the dike. This is the artwork for our Official 2018 Festival T-Shirt. They will be on sale at the CaberDancer tent in front of the Visitors Center on Main street during the festival. Perhaps the favorite all-time band of the Dandridge Scots-Irish Festival. The Martin Family keeps on growing, not only in numbers of incredible musicians and dancers, but in the depth and reach of their Celtic music experience. Nelson & Elaine Martin have brought their children, and now their grandchildren up in the Pennsylvania mountains, absorbing all of the ancient Scots-Irish traditions, instruments and sounds. We've seen their family grow and now look forward to their up and coming grandchildren playing, singing and dancing for the wonderful folks of Dandridge, Tennessee. Come see, hear and meet the Celtic Martins. Kathryn Powell, from Arlington, Texas, will share Scottish and original songs & stories on the Lowland Stage...with the help of her fiddle, guitar, a couple sock puppets, and a few friends. Also, don't be surprised to find her reading stories in the 'Days Gone By' Children's playground! Kathryn will aso participate in the Ceilidh by the Loch on Saturday night and the Kirking of the Tartans at Dandridge 1st Methodist Church on Sunday. Katie Carver , Champion Irish Step Dancer, is also long thought of as 'Family' in Dandridge. She will bring her students to perform Irish Dancing on the Lowland Stage. She will also perform in the Ceilidh on the Loch, Saturday night. Col. Randy Gratz, USAF Ret. is a native of East Tennessee and following a 39-year career in the Air Froce moved to the Florida Keys. He and his wife Sarah now split their time between Florida and the Maryville area. Randy will be performing demonstrations of the traditional highland athletic events, including the Caber Toss, Weight over the Bar, Hammer Throw & Sheaf Toss. John Miles, reitired Marine and active duty Scots-Irish Heritage expert, will be presenting at Maury Middle School on Friday the 28th and on Main Street during the Festival on Saturday. Trip Rogers, the powerful Irish music icon is on a mission…to make Celtic music that forces folks to stand up and take notice. This is not the fragile, romanticized Celtic music you hear in movie soundtracks, but the kind that makes you sing along and stomp your feet. This seasoned music veteran from Mint Hill, NC, weaves traditional Scottish and Irish music with original creations while adding a southern swagger that sets the stage on fire. Trip's stage presence creates a rebel rousing party that not only draws fans in, but makes them feel like a part of the show. Trip Rogers delivers the beauty and tradition of Celtic music, new and old, with the guts, showmanship, and attitude of an arena rock band. You will likely find him wherever kinsmen are gathered and the craic is lively! Kelly Shipe an outstanding Piper & Harpist, has been our 'Lone Piper on the Dike' following our Ceilidh by the Loch, for all ten years of the Festival and will again do so in 2017. Taken from the Military Tattoo annually at Edinburgh Castle in Scotland, Kelly shown above spotlighted on an otherwise ptich black dike at 9pm, is an awesome sight, and sound, to behold. The above photo is a live performance at Dollywood. Claire Macmillan Champion Highland Dancer from Knoxville, long accepted as 'family' in Dandridge, will return for her 9th year to offer Highland Dance demonstations with her students as well as to perform in the Ceilidh on the Loch Saturday night. We are a high energy Celtic 'Fusion,' band. Our music style is a fusion between Celtic Contemporary,Traditional and Rock. Our music includes music played on bagpipes, guitar, drums, fiddle and whistles. We play original music from our CDs as well as Celtic favorites. We are a touring band who perform at Scottish Highland Games, Celtic Festivals, Music Fairs and Theaters, throughout the USA, Canada and Internationally. 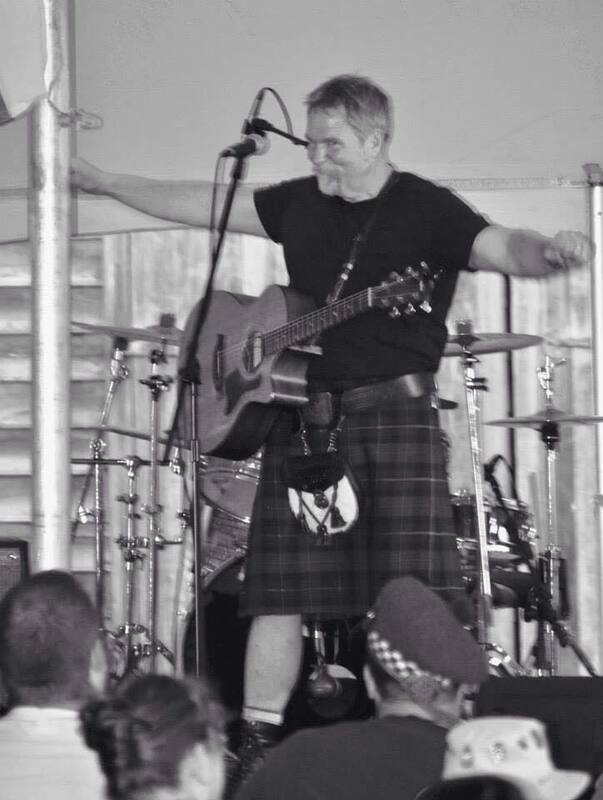 We perform in full Scottish Highland Dress....Oh, and our lead singer is from the Scottish Border, so the accent is real! To learn more about MacGilliossa, please browse through our website. Bob Valentine Emcee & Entertainer Extrordinaire will return again to host our Friday night Sponsors & Patrons Appreciation Reception and to Emcee our Highland (Main) Stage on Saturday as well as the Ceilidh on the Loch Saturday evening. Conny Ottway, the O'Kennessee Strings, and Conny's music students, from Knoxville, will perform in the Revolutionary Graveyard on Main Street throughout the Festival on Saturday. The Maury Singers, a wonderful choral group from Maury Middle School in Dandridge, will be performing at our Noon time Opening Ceremony on the steps of the Shepard Inn. Mention you are staying for the Scots-Irish Festival to receive a discounted room rate! Southside of I-40 at Exit 417, the Quality Inn is 2 miles from Historic Downtown Dandridge. All rooms have free WiFi, flat screen TVs, Premium Cable channels, refrigerators & coffee makers. Quality Inn offers a continental breakfast as well as free coffee in the lobby as well as a fitness center, guest laundry facities and free parking, plus a business center, seasonal outdoor pool and a sundeck. Want to be a Vendor in 2019? Have Scottish, Irish or Celtic Themed Products? Contact us at Info.ScotsIrishfestival@gmail.com or print off an Application & send it for consideration. INTERESTED IN VOLUNTEERING TO HELP WITH THE FESTIVAL? The Thistle Club of the Dandridge Scots-Irish Festival is for those individuals who wish to be Contributing Patrons of the Festival. We have three categories of Patron Programs: Golden Patrons, Benefactor Patrons and Heather Patrons. We would be very grateful if you would consider contributing to support our festival. Thank you so much for your continued gratuity! IF YOU WOULD LIKE TO BECOME A CONTRIBUTING PATRON, PLEASE SEE OUR PACKAGES BELOW. The Golden Patron's Package requires a minimum of $300 contribution to the Festival. 2. Two Reservations at the Friday Night Reception at the Highland Stage area behind Town Hall & for the Gathering following at the Shepard's Inn. 3. Admission for two at the Shepard's Inn on Saturday for rest, a cold drink & restrooms. 4. Front Row Reserved Seats at the Ceilidh by the Loch, Saturday evening. The Benefactor Patron's Package requires a minimum of $100 per individual or $200 per couple contribution to the Festival. 4. Front or 2nd Row Reserved Seats at the Ceilidh by the Loch, Saturday evening. The Heather Patron's Package requires a minimum of $50 per individual or $100 per couple contribution to the Festival. 2. One/Two Reservations at the Friday Night Reception at the Highland Stage area behind Town Hall & for the Gathering following at the Shepard's Inn. No group is more important to this festival than our sponsors. Our festival is totally driven by our sponsors and contributing patrons, which allows us to offer free admission to the public. Thank you Sponsors! Accessible Parking Locations in downtown Dandridge - Shuttle Bus will be available from the large lot on Cherokee Drive at W. Main Street (far lower left) Handicap Parking will be available at the Cherokee Street location (far left on map below) with Golf Cart shuttle service as well as bus service to the festival area on Main Street. A Celtic Ale Garden has been included an added dimension to our annual Scots-Irish Festival. 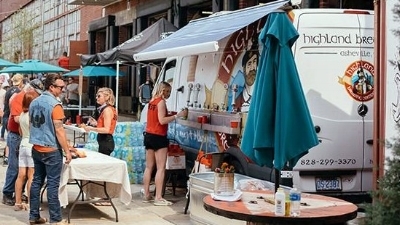 Various ales from the Highland Brewery in Asheville will be provided by Cherokee Distributing of Knoxville. Each person of legal age will be able to purchase up to three ales during the day of the festival. More information about the ales and prices will be coming soon. The Scots-Irish Ale Garden is located just a few steps from Main Street, and within view of the Highland Stage entertainment.